The brand-new Simone-de-Beauvoir pedestrian bridge, already famous for its vibrations, which we did feel. 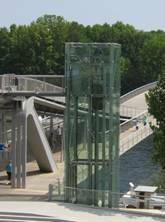 The thoroughly modern pedestrian bridge even has its own elevators on each end. 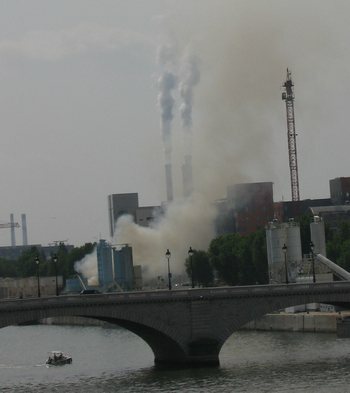 Looking east from the pedestrian bridge, the air was disgusting with smoke from the “déchetterie,” or trash-burning plant. Very green water in the reflecting pools in the Bercy park. Pumps like this have been installed to help improve the water, which I think comes from the Seine. But the pumps aren’t helping much, it seems. 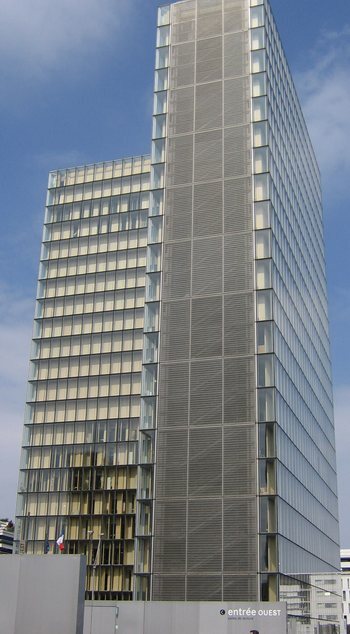 One of four towers that comprise the Mitterand (National) Library. The sky looks much better in this direction (looking west). Water in the Seine does not look so clean. Another view of the reflecting pool in the Bercy park. Dinner at Le Tire Bouchon on Friday night with friends was delightful. We’ve been going to this restaurant for eight summers now. One year, last year or the year before, the quality seemed to slip just a bit. But Chef Laurent Floury is right back up there at the top of his game again this year. We had the best dinner we’ve ever had there. I think this restaurant is now once again my number 1 recommendation. And, importantly, it is air conditioned and now entirely non-smoking. Yesterday, Tom and I went on one of those marathon 5-hour walks. We wanted to take a look at the newest addition to the annual Paris Beach event. When we emerged from the end-of-the-line Gare d’Austerlitz métro station, we had a pleasant little walk along the left bank there, going yet farther to the east. We were amazed at the majesty of the façade on the Austerlitz train station itself. We did walk through one dicey area just to the east of there where many homeless people have set up their tents, but it seemed safe and orderly. Just not that pretty. The homeless had wisely set up their “homes” under a building that hung out over a street that was almost never used. 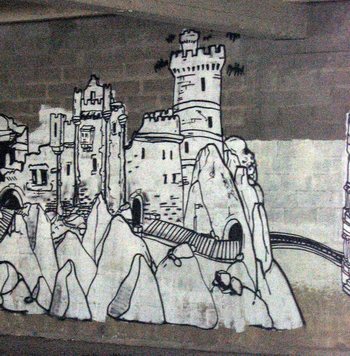 We saw some elaborate graffiti under there. The homeless were asked to move away from the Paris Beach areas. The newest addition to the Paris Beach begins at the Bercy bridge and continues to the Tolbiac bridge, in front of the Mitterand (National) library and directly across the Seine from the Parc de Bercy. In the midst of this stretch is the new, architecturally interesting Simone-de-Beauvoir pedestrian bridge. There is not so much sand used in this section of the Paris Beach. Even on the right bank this year there is far less sand. The environmentalists complained bitterly last year about the damage done by moving all that sand back and forth, and the fuel consumption required to do it. The Mayor of Paris, Bertrand Delanoe is, or has been, a member of the Green Party, so he had to listen and take remedial action. So, a lot less sand. But who cares. This newest stretch of Beach is far, far less crowded than the right bank. The crowds on the right bank are just insane. The new Beach is also the site of Paris’s newest municipal pool, the Josephine Baker, which is on a barge floating next to the bank of the river. The newspaper here claims that water from the Seine is used in the pool (although chlorine is definitely added). The bureaucrats here have been making all kinds of assertions, in fact, about how absolutely clean the Seine is. Same goes for the lakes in the parks, they say. 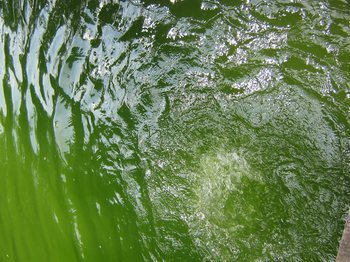 However, as the weather gets warmer, the water is looking greener and greener. 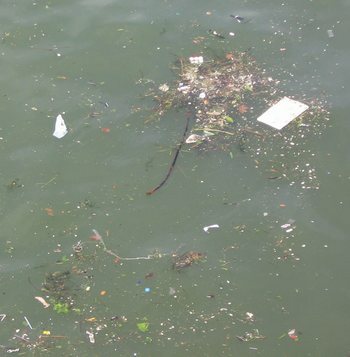 There are also places where there is way too much garbage floating in the water. The officials say that the reason swimming in the Seine and in the lakes in the parks is banned is for safety and security purposes, not because the water is too polluted. However, when the helicopters were flying over Paris yesterday to make video footage for the Tour de France, the river looked bright green! Look at my photos from yesterday and decide for yourself. After enjoying the new improvements to this eastern section of the left bank, we crossed over the new pedestrian bridge to take a pleasant walk and rest in the Parc de Bercy. This is one of our favorite parks in Paris, and it is relatively new (perhaps 12 years old?) I’ve written about it in prior years’ Paris Journals. The years are proving that good design just gets better with age. Although it is a newer park, the decision was made at the beginning to keep the many large, old trees that lined the cobblestone streets that used to cross the park in many places. In fact, the cobblestone streets were kept, too, and are integrated into the park’s walkway system. This heavily shaded park is a good place to be on a hot day. The beautiful garden in the park is named for Yitzhak Rabin. 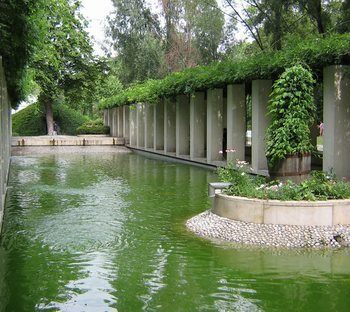 It includes some long reflecting pools that use, I think, water from the Seine. These pools are now very, very bright green. I just can’t seem to get away from algae blooms. They’re there in Sanibel, and here in Paris. After making our way slowly through the park and thoroughly enjoying it, we checked out the cafés at the Bercy Village, located adjacent to the far end of the park. The food at the Nicolas café (same as the wine store chain) looked the best, and the prices were extremely reasonable. There are outdoor terraces on both sides of these cafés, so you can sit in the trendy and Disney-esque Bercy Village court, or you can sit on the other side that faces the very real neighborhood of the 12th arrondissement. We were about to ask if we could be seated on the real side, on the terrace, when the smart waiter said that inside, the dining room was air conditioned, and non-smoking, and if we were hot, we might like that. (All this was in French, which I understood completely and explained to Tom later.) We were indeed hot. We ate inside, and it was wonderful. The wine sold by the glass includes many choices, with very low prices. Their objective is to get you to try different wines, and then you might buy a few bottles in the wine shop that is part of the restaurant. There are symbols on the menu to suggest which wines to try with which salads or main courses. The air conditioning was real, not a false promise as is often the case. Tom’s bottled water was not just cold, it was absolutely frigid. The food was very, very nice, but simple. The placemats indicated that there are other Nicolas cafés in other parts of Paris – one at the Place de la Madeleine, for example, and one at 17, avenue de l’Opera. We will have to see if these are just as nice, cool, and reasonable, because it is hard to find a GOOD brasserie in those places. At lunch we realized that we weren’t too far from the Promenade Plantée, one of our favorite walks because the promenade is built up one or two levels from the street, where an elevated train track used to be, and atop the workshops called the Viaduc des Arts. The promenade is quiet, and beautifully planted and designed. It took us up to the Place de la Bastille, where we saw one of the big groups of rollerbladers taking off for one of their Randonées. Once again we were footsore, so we took refuge and rested in another park alongside the basin where the St. Martin Canal emerges from its tunnel, before it connects to the Seine. This park, named for the arsenal that used to be there, was also pleasant and led us most of the way down to the Seine without our having to deal with cars/traffic. After traversing the length of the mad part of the Paris Beach, we went up to where I thought we might watch the Tour de France as it raced through the heart of Paris. This wasn’t my idea, but Tom wanted to try to see it in the flesh, whereas I maintain that you see so much more on TV. 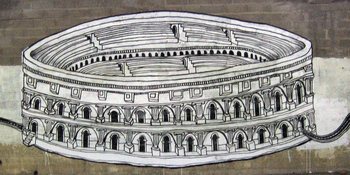 When he saw the crowd already gathered along every inch of the route, he agreed with me and we caught the métro at Solferino and went home. The end of the Tour de France was magical, with the very well-liked Floyd Landis in the yellow jersey. So nice for an American to win once again. But this American is evidently much more popular among the French and among the riders than Lance Armstrong. One of the riders who used to be with Lance explained that people like Landis because he is not “bossy,” the implication being that Lance, who was known as The Boss, was too bossy. We then had another nice dinner en famille with Dan and Mary at the brasserie on the Parc du Commerce. The waiter was very sweet and smiled a lot, and the food was good. Dan and Mary had already eaten at McDonalds, so they just had a few snack-like items as Tom and I had dinner. But it was fun. 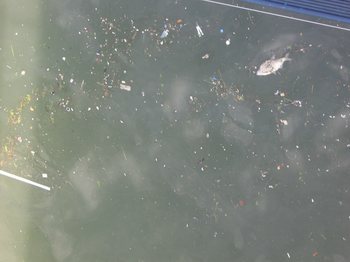 Dead fish and litter in the Seine. 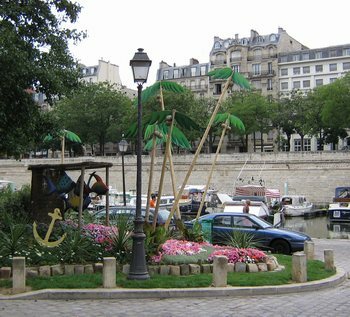 A composition in the Park of the Arsenal, below the Place de la Bastille, with houseboats nearby. The floating Josephine Baker pool on the left bank, on the city’s east side, near the Mitterand Library.